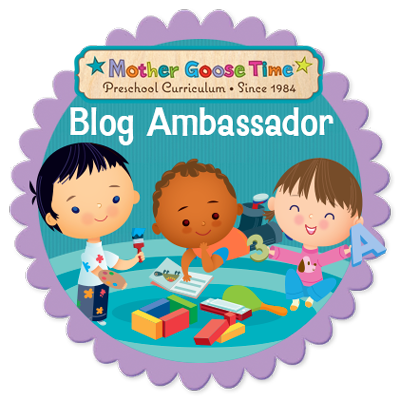 October’s Mother Goose Time theme is all about Weather and Seasons! I’ve been really looking forward to this unit. X has shown a lot of interest in how weather works- especially after Hurricane Irma. Today we started off with Day 1: Sun. We had an illuminating discussion about how the earth spins to create night and day. X decided he wanted to make a sculpture instead of using the included materials to make a sun. Next they both worked on the pattern mats using shape links to create a sun and a cloud. Q moved on to some color matching while X worked in his More Litteracy workbook. I was so thankful to have something more challenging for X to work on while Q worked on his colors. X really loves workbooks, I guess I lucked out! Q worked quite a while matching the links to the colored suns. By using the cards flat (instead of in the cube) Q could work solo. I love any unit themes that I can easily expand on for X. This was deffinitely one of those. Firstly we get MGT’s More Math and More Litteracy workbooks. These are such a great resource! They have phonics, writing practice, games and more advanced math concepts. I can’t wait to share more about these later in the week. I also found this fun science kit online. Using the Alex Ready, Set, Bodies! kit last month added a great element to our days. I think X will be excited to dig into these awesome science experiments. X loves these lift the flap books. 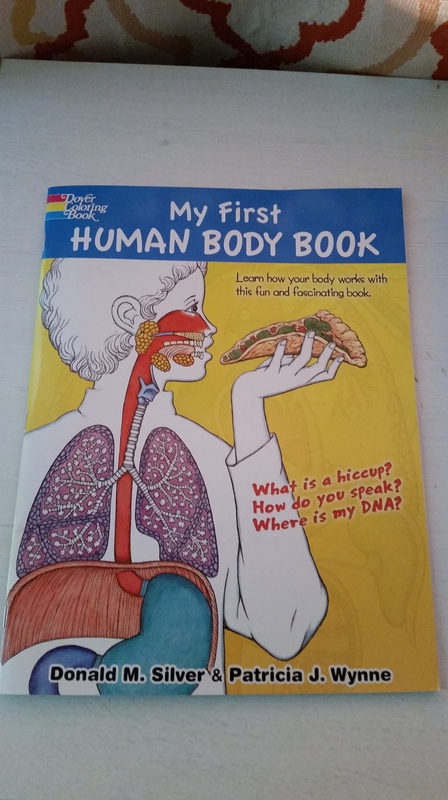 They provide the perfect amount of science and facts for his current learning level. My kids are book worms, so the more books to support our theme the better! This month had been such a great start to the year. 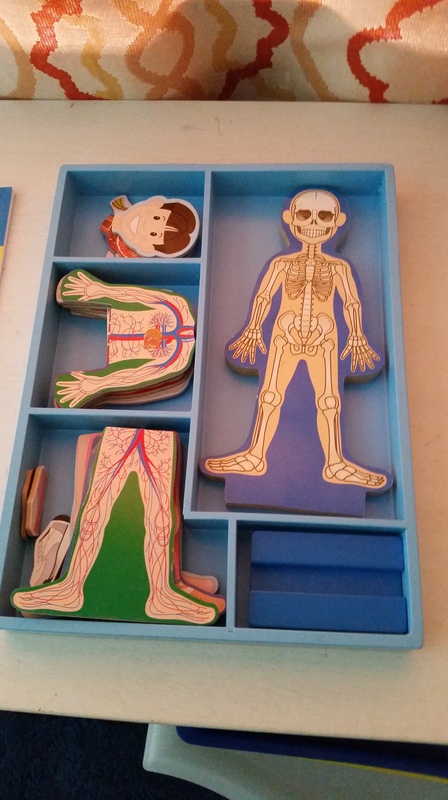 X has loved learning all about the body. 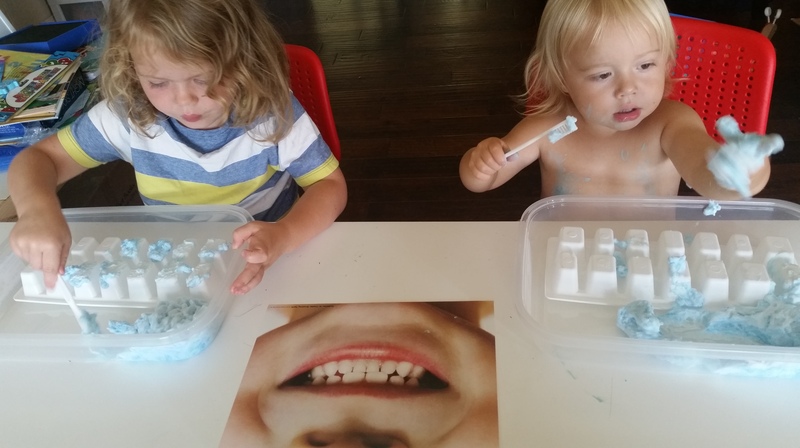 I wanted to share a few of the awesome activities we did with Mother Goose Time while learning about the 5 senses. The boys just loved learning all about their sense of smell. We made flowers and built gardens. They really enjoyed digging in and creating their garden. I loved how X taught Q about patterns and how well they cooperated. I considered giving them seperate bins of dirt, but I’m glad I didn’t. They worked great together and we’re more creative. Q worked on some color matching and X was all about the patterns. This additional skill work was completely self motivated by them both. It’s so cool when they expand on an activity all on their own. They also decided their garden needed some grass. This activity held their attention for over 30 minutes. Next we moved on to creating flowers that had a scent! They applied scented gelatin mixed with water. It created a good scent and a fun texture. They enjoyed the opportunity to get creative and use a medium they’d never explored before. 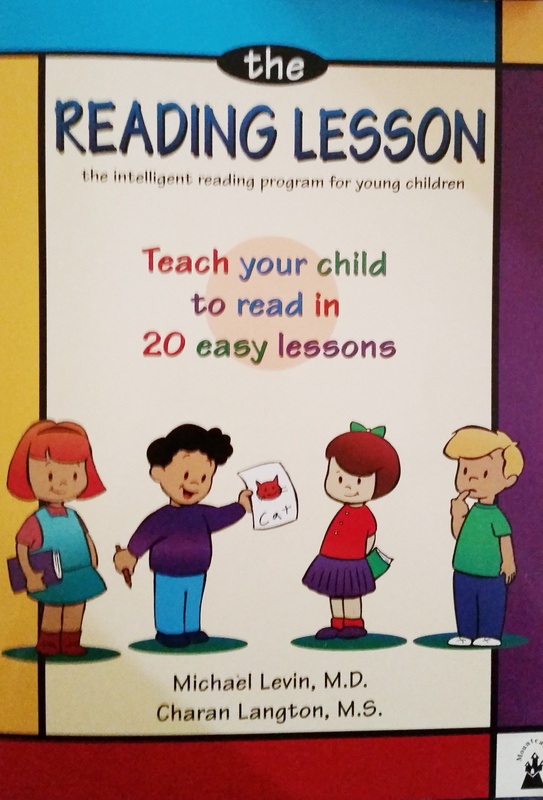 Next we moved on the the I Can Read book for this month. It features an adorable skunk. X enjoyed using the pointers and used the space provided at the end to practice his writing. I was so impressed with his writing skills! 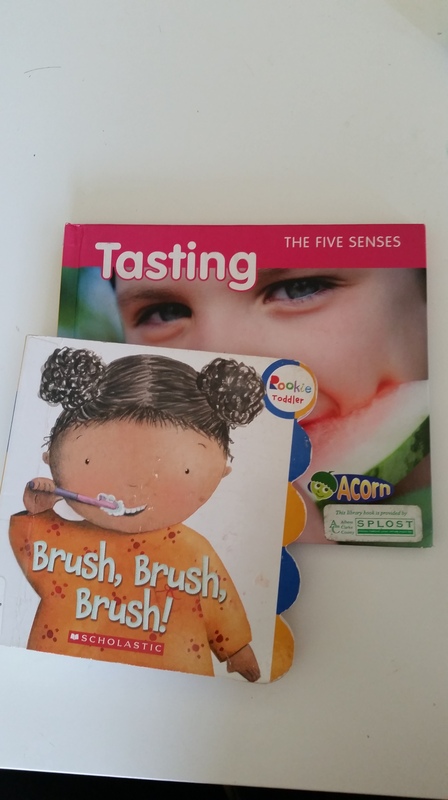 Here are a few more highlights from learning about our senses! Both boys just loved this sand painting activity! Q loved the texture and X enjoyed pouring and mixing colors. I put this phonics matching game together to help X work on the letter sounds. He really enjoyed this hands on approach! This month has been so much fun, but we just can’t wait to start learning about weather! Homeschooling a preschool aged kiddo and a Kindergartener can take a little juggling. Last year as we worked through the Mother Goose Time curriculum they each worked on the projects at their own capacity. Fine motor, language and sensory experiences were Q’s focus, while X was working on letters, math and bigger concepts. Now, I’m doing two different programs with them and using MGT to bridge the gap. Q is working on the Mother Goose Time in its entirety, while X is getting more in depth on the topics and learning to read. Here’s a peek at what our day looks like. After we wake up we cuddle and read a few books. Then we sit down for breakfast. After that the boys do some free play on their own while I clean up and get ready for the day. X starts his morning with reading. He’s most focused first thing. Q will happily look through his own books while X and I work through a few pages in The Reading Lesson. 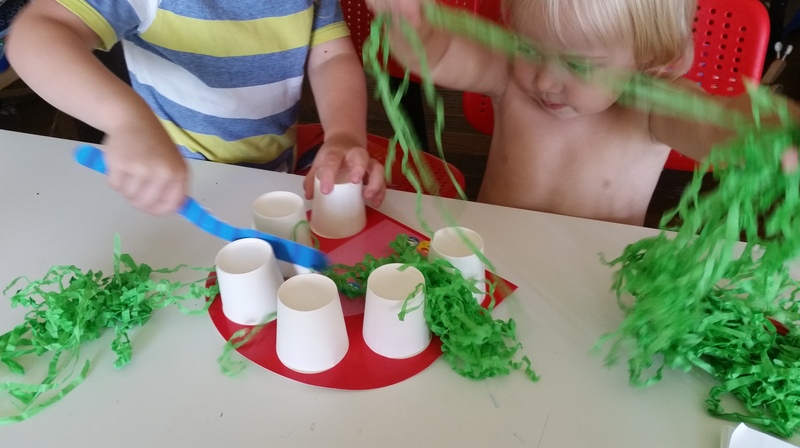 Next we usually jump into the Invitation to Create or the Make and Play, depending on what is provided that day. This is a great opportunity for them to work side by side on the same thing, but following their own ideas. 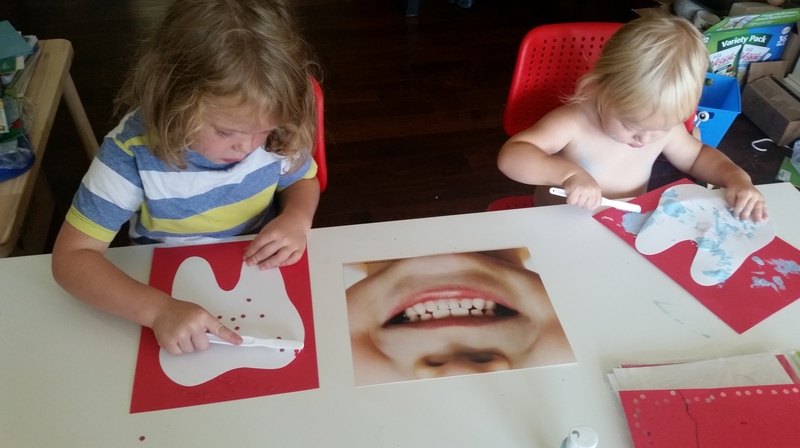 Today X used a hole puncher to make “germs” and then brushed the germs off his tooth. Q explored the included toothbrush by using paint. Then we do either sensory play or a gross motor activity. This year MGT includes a variety of STEM station ideas that are so much fun. This one was just perfect to go with learning about our teeth. The boys had a blast brusing and squishing the shaving cream. Then we usually do a little reading. After all that fun the boys are ready to focus again. We’ll read the books suggested by MGT for that days theme. 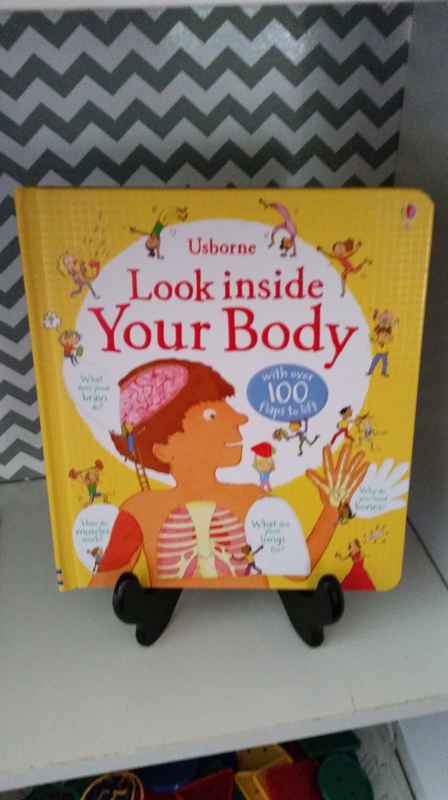 We also find the section in our Usborne books about the body to learn more facts. Today that involved learning about our tastebuds! Next we worked on some fine motor work and counting with a little bit of adding for X. Both the boys loved this activity! 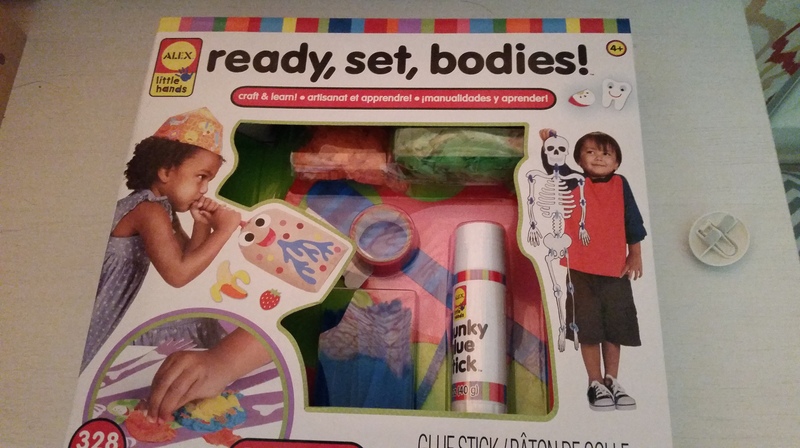 We finished up with this fun activity from our Alex Ready, Set, Bodies! kit. These activities have been such a great addition to our learning this month! They used cups to add teeth to the mouth. Then X put stickers on the tongue for different areas of tastebuds. Finally they got to brush away the germs and food stuck between the teeth. So much fun! Today the boys were really engaged in all of our activites, so it filled our school time. 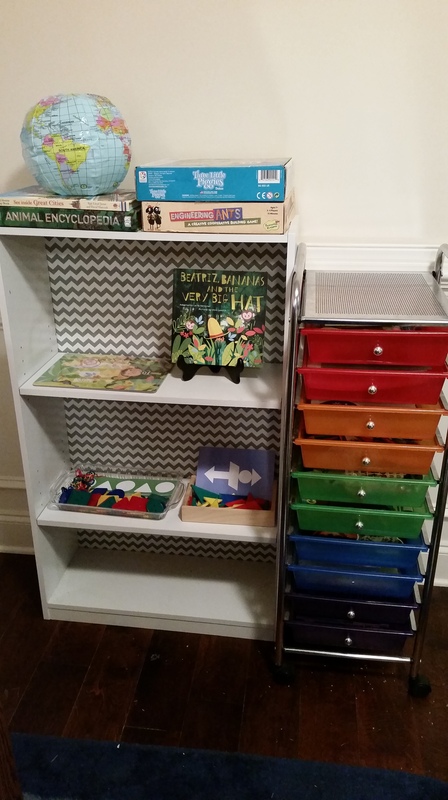 Other days they move a little more quickly through the activities and I’ll supplement with our tray activites for Q and some critical thinking games or workbooks for X. After school time we have lunch and then nap. We spend our late afternoons playing and exploring outside before dinner. I really make sure to alternate fun, creative or gross motor activites with the activites that take a lot of focus. 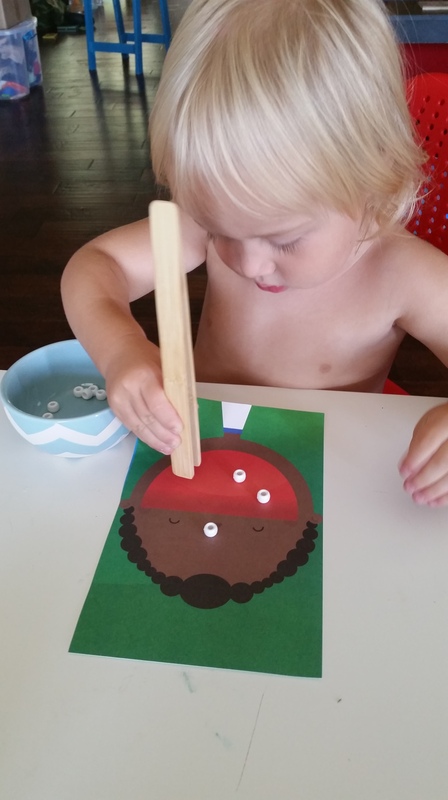 This allows them to get their wiggles out and gives them the ability to focus on harder tasks. It really makes the flow of our day easier. I also completely follow their lead on how long we spend on each activity. The beauty of homeschooling is we can spend as little or as much time on activities as we want. 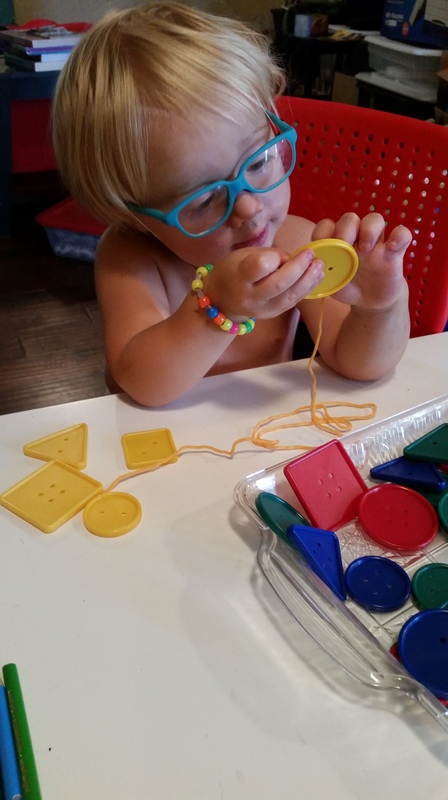 Often times we also revisit an activity (usually a sensory play or STEM activity) after nap. I love seeing the variation on play when doing something again. They make completely new discoveries and connections. 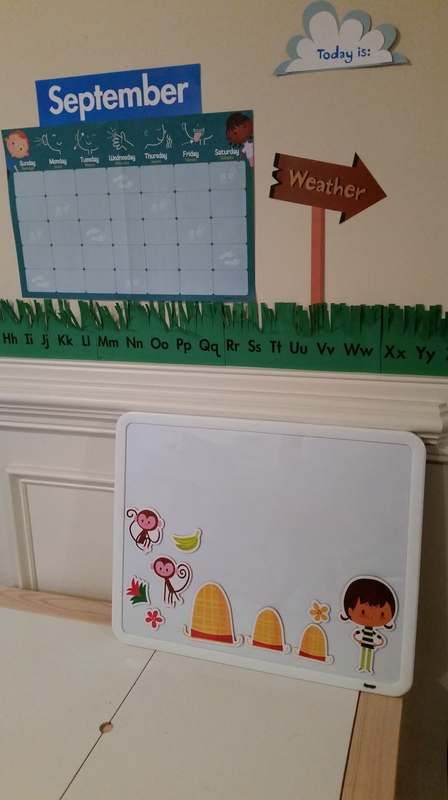 We had a great long weekend visiting with family, but tomorrow we will officially be starting homeschool Kindergarten! I rearranged a little since my last post, but I think I have a good setup now! I really debated on what I wanted this next year to look like. X is only 4.5, but is well past preschool aged knowledge. He loves doing school and wants to dig deeper. 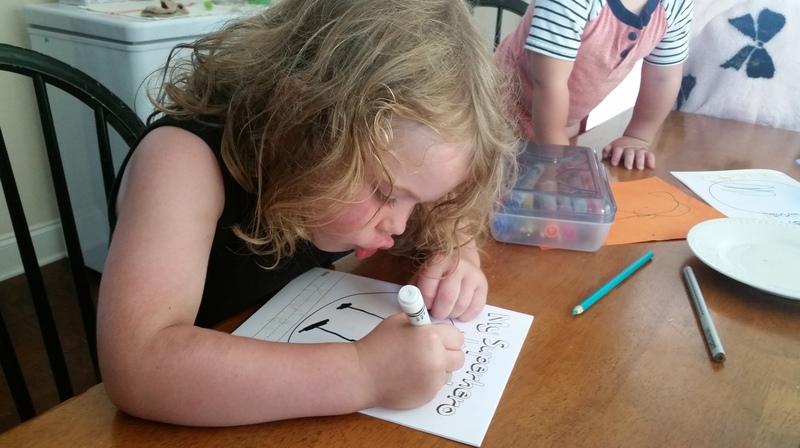 We’ve been doing Mother Goose Time for over a year now and have really loved it. Originally I’d planned on only doing MGT with Q and doing something different for kindergarten with X. But the more I thought about it, the more I realized there are so many parts of the Mother Goose Time curriculum that X would want to do too. The themes for this year are so great, I knew he’d love them. So I decided to use it for kindergarten and expand on the core subjects a little more. Here is a look at what we’ll be using in addition to our MGT for September. 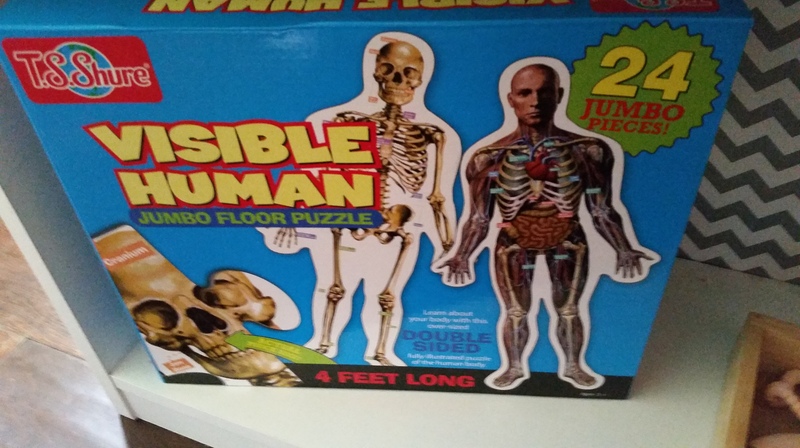 This 4ft floor puzzle has the skeleton on one side and the organs and muscles on the other. X was so excited about this awesome lift the flap book. He’s been flipping through it on his own. 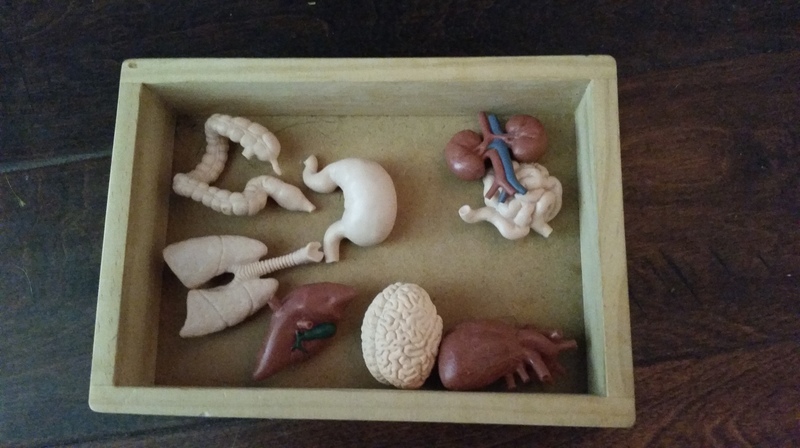 These are mini 3-D models of the organs. I was excited to find these from Safari LTD Toobz. We’ll be using them for a variety of games. This is a coloring book, but is also a great reference book! That’s all the fun stuff we’ll be using this month in addition to the MGT curriculum. Now here are a few items we’ll be using all year. 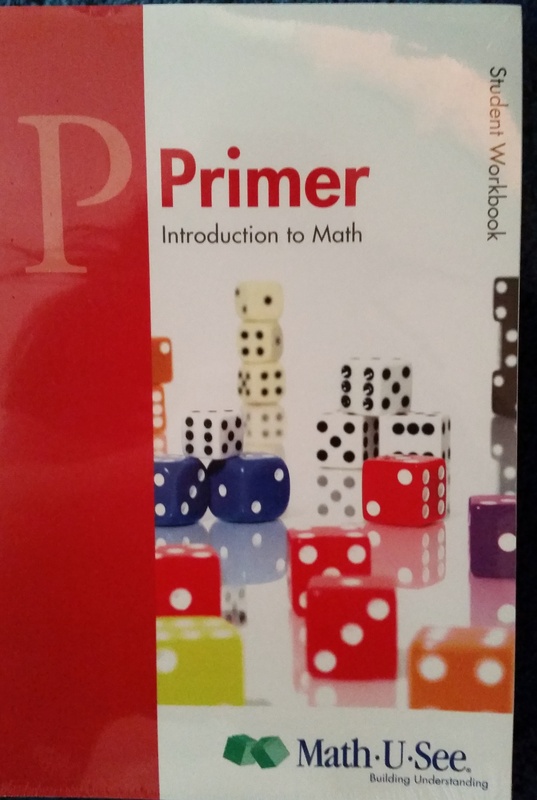 I’m really excited to start Math-U-See. 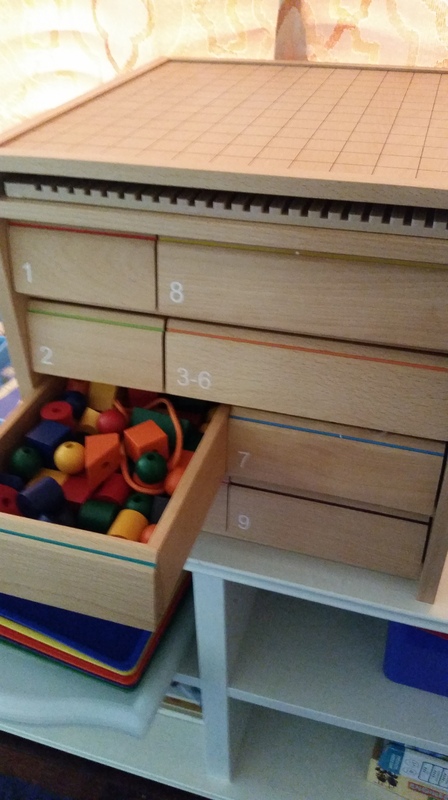 It’s a math program that uses manipulatives. It will be an easy transition from MGT for us. X is so hands on, I think this will be great! X is so ready to read! This is the program we’ll be using. 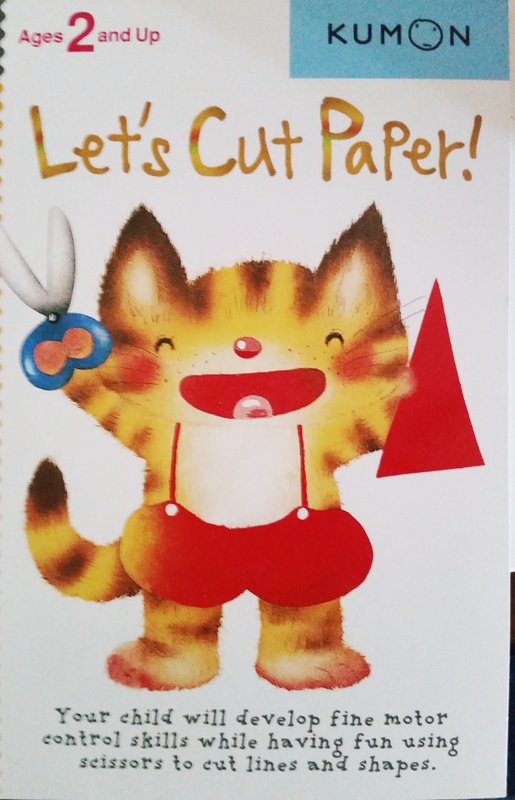 X loves any excuse to cut, so I think these projects will be really fun. 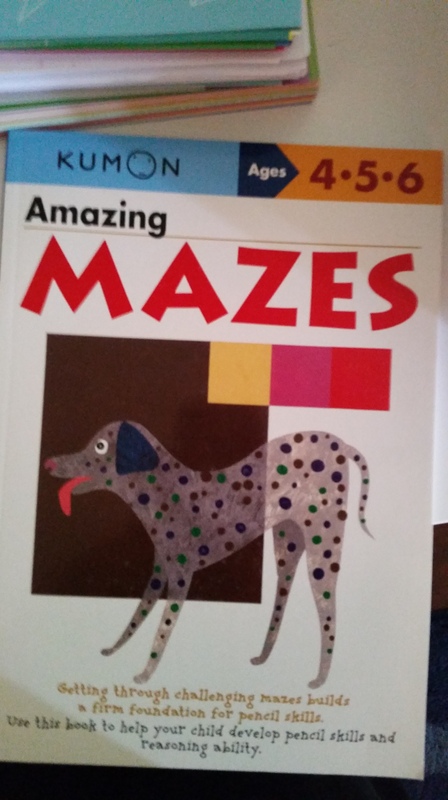 X loves mazes and I love the critical thinking skills he’ll be building. It will be fun to work these in to our school time. 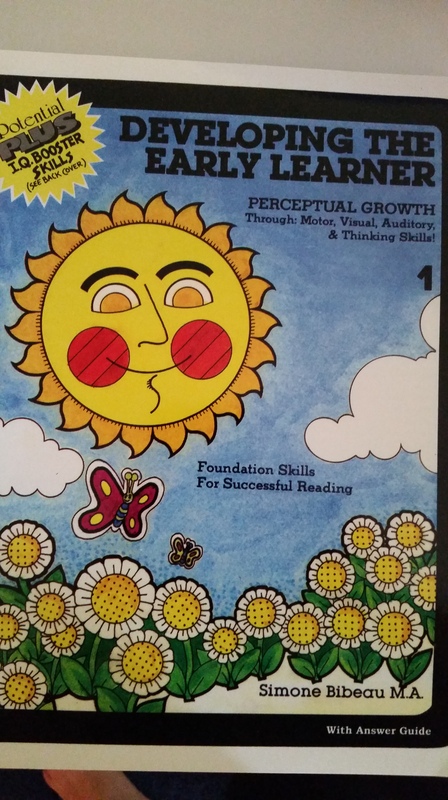 This is a series of 4 workbooks that build critical thinking skills. X actually really likes workbooks, so I think he’ll enjoy these games. 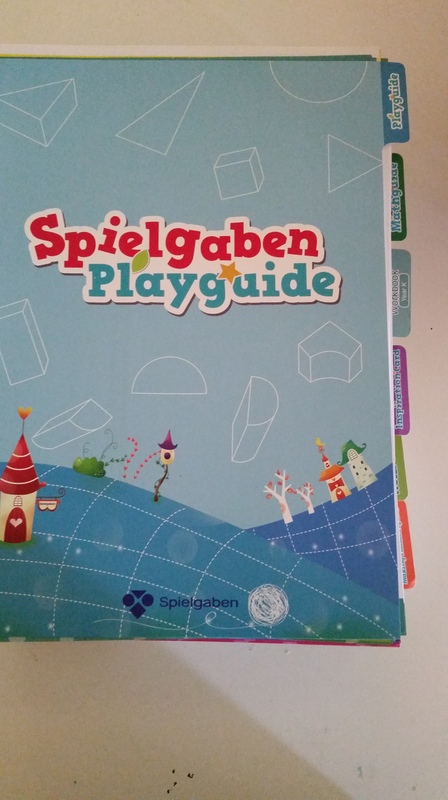 Lastly, we’ll be building math skills using our Spielgaben as well. X loves using and building with all the loose parts! 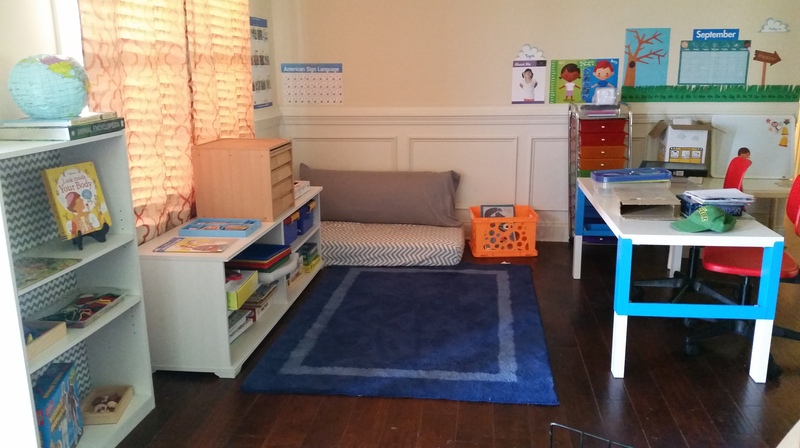 We recently moved and my big goal has been to have our homeschool area all setup by September. 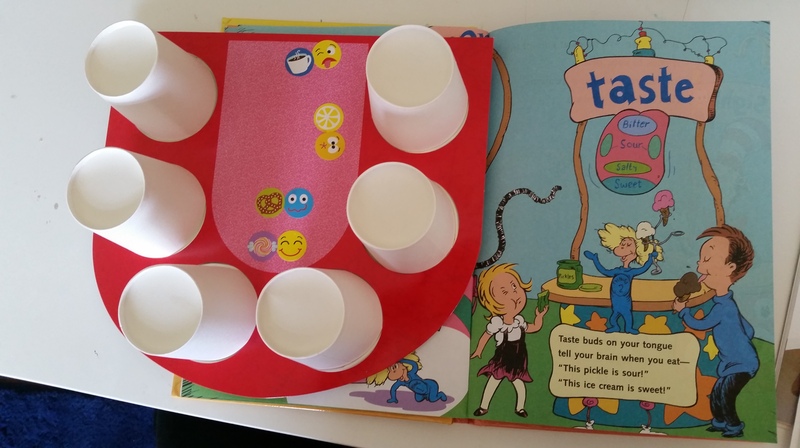 I’m making great progress towards this and when our September Mother Goose Time box arrived I was excited to add the Circle Time materials to our setup. This school year is going to be a little bit different for us. X will be starting homeschool kindergarten! I will be supplementing our Mother Goose Time curriculum to add more challenging content, but we will be sticking to MGT themes. I will go into some detail on what I’m adjusting during this post, but I will be posting on what exactly I have planned, later this week. Now here’s a glimpse of our setup. I still have more work to do, but this will be an “in progress” post. X has recently been very interested in days of the week, months and time. So I organized our Circle Time display to focus strongly on these. In all honesty, we haven’t really done much for Circle Time in the past. We’ve just jumped into the days topic. With X’s heightened interest, we will focus on this so much more. I’ve altered our setup from what you may see from other MGT bloggers. X is very familiar with his letters and numbers, in fact he’ll be learning to read this year. So I removed the area that focuses on the monthly letters and numbers. I did still include the number tree because I think he will enjoy adding new leaves as the year progresses. Another change I’ll be making this year is I’ll be giving the boys access to the manipulatives, book and puzzle all month long. 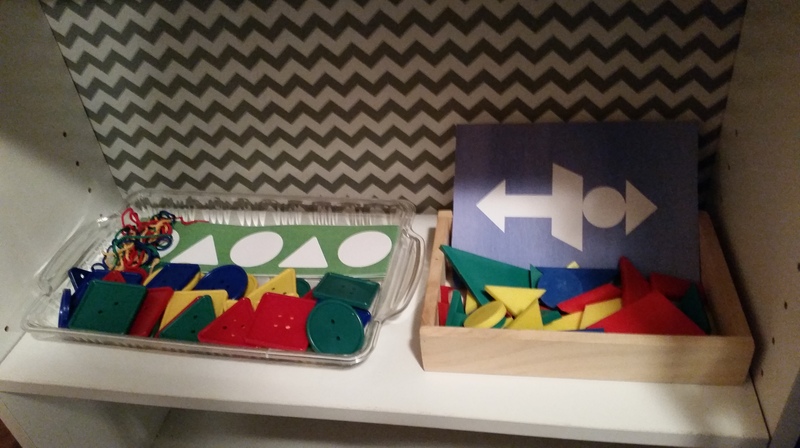 I’ll also be including any games or activities that utilize the manipulatives on the trays. Both boys like to use these items during free time. Now that Q is past the age of just making a mess, I think they’ll both use them frequently. 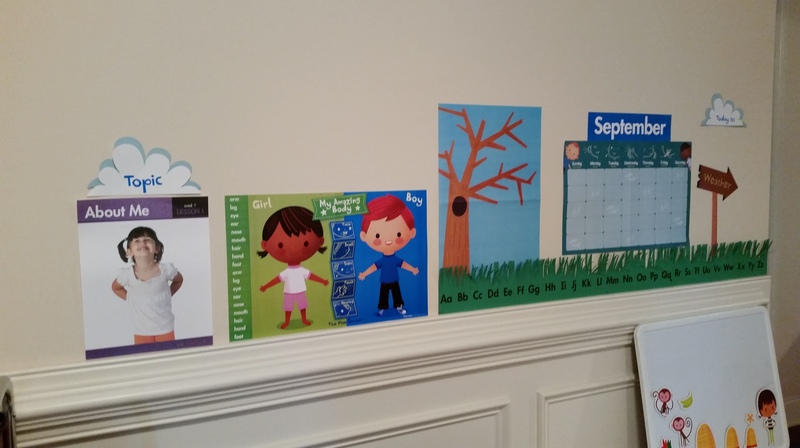 A new feature this year that I’m very excited about is the magnetic story pieces. I love the story book with matching puzzle, these will add another layer of literary integrated learning. I was so impressed with the quality. They are thick pieces that will not get bent. I have a feeling that X will combine pieces from various stories to create his own tales as the year progresses. I’ll be adding a reading corner with all of the suggested books for the month as well as an Invitation to Create gallery! Stay tuned to see my progress! 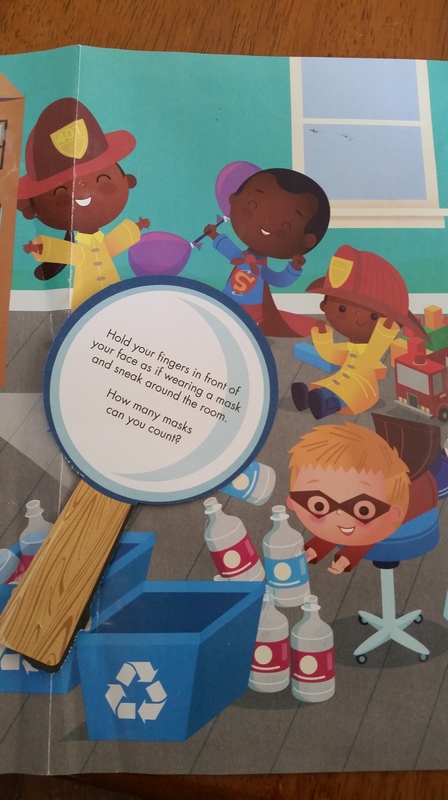 I received this month’s Mother Goose Time curriculum free of charge in exchange for sharing our experience and my opinions. All content and opinions are 100% mine and truly honest. The Physics of Super Heroes! We’ve been having such a blast with our Super Hero unit from Mother Goose Time! 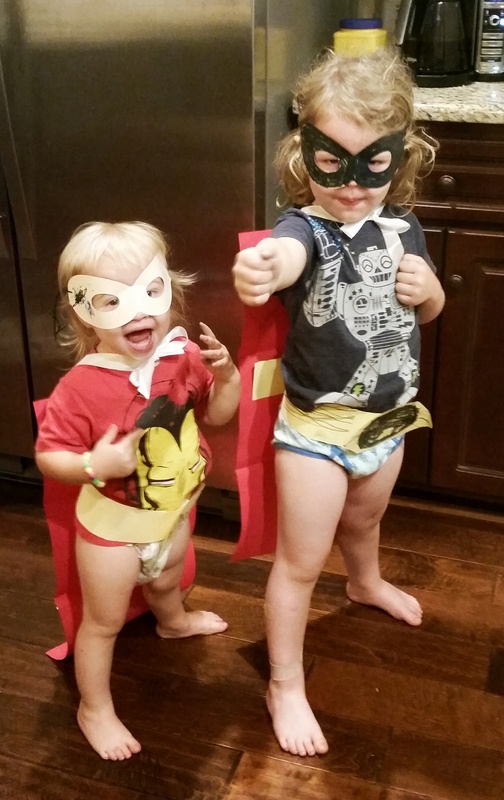 My boys love super heroes and love dressing up, so I knew this unit would be a hit. What I didn’t realize is how much they would actually LEARN! Being summer I thought maybe the curriculum would be a little light on the learning and more focused on fun. There has certainly been plenty of fun, but it has also included MGT’s normal dose of awesome learning! Today we talked about Super Breath! What could you do if that was your super power? This led to a pretty great conversation with some pretty creative ideas. X decided not only could he MOVE things with his super breath, but he could create weather with his breath as well! I love how presenting Mother Goose Time concepts gets him really thinking and being creative! Next we experiemented with our own Super Breath! This fun activity led to early physics concepts! Who would have thought, physics in preschool!! 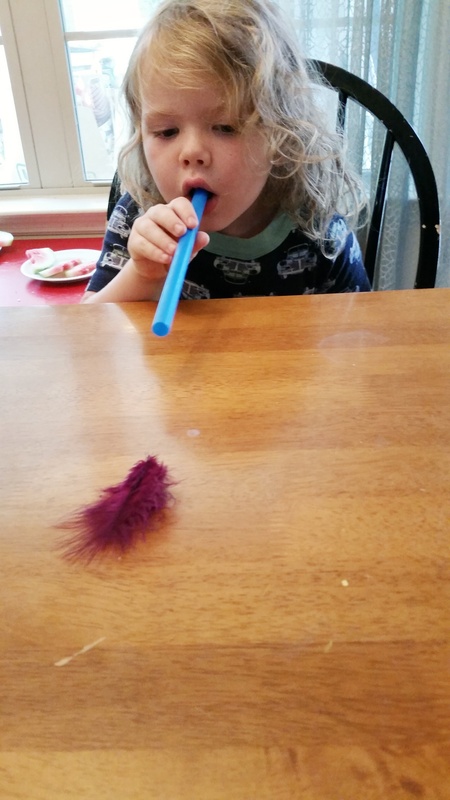 Is blowing with just your mouth or with the straw more effective? Why? 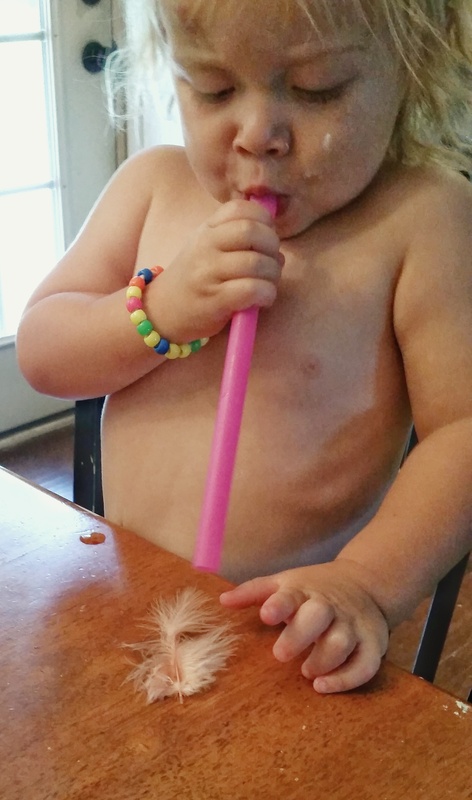 Is it easier to blow a feather or a cotton ball? Which travels further? Why? This gave us some great opportunities to make and test a variety of hypothesis. But of course it wouldn’t be a Mother Goose Time activity unless it incorporated more then one subject! We practiced seeing how far we could make the cotton balls travel with one breath. Then we measured how far they traveled! I just love how many creative conversations this activity led us too and how many big concepts and skills we got to practice! 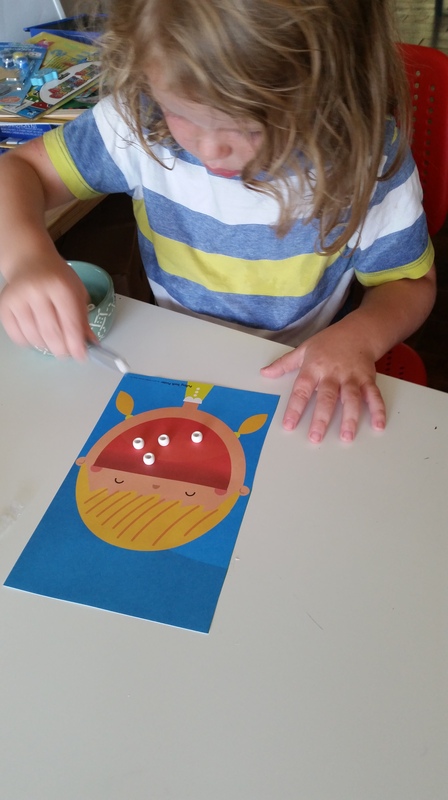 August’s theme from Mother Goose Time is SUPER HEROES! We are all fans of the Heroes around here. I’ve collected comics for years, my husband and I even got married in Batman shirts. So, as expected, our littles are also pretty big fans. You can imagine our excitement when we opened our big, yellow school bus box to discover an entire month devoted to all things super! We are also still in the throes of moving and unpacking, so we welcome the togetherness and focus that MGT carves out of our busy days. We spent our whole first week creating super hero outfits! Each day was dedicated to a piece of the uniform. I must say, putting it all together this morning was exciting for all of us. 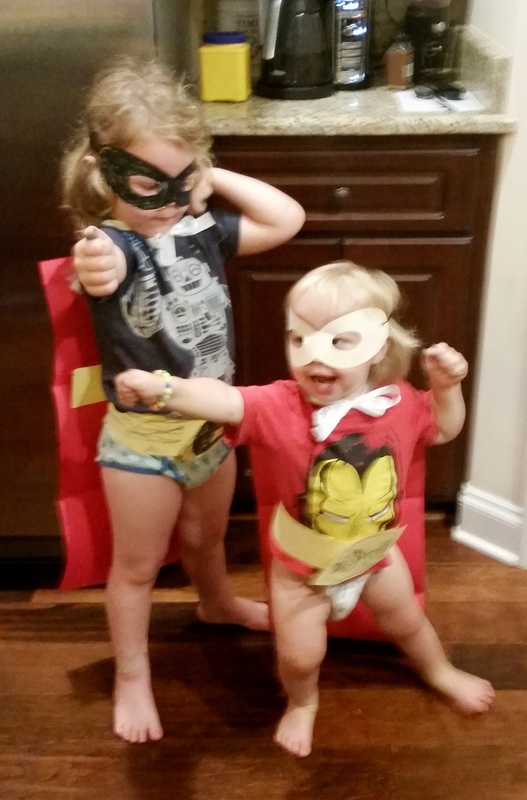 They’re so cute in their self created super hero outfits! They spent the rest of the morning soaring around the house and exhibiting triumphant feats of strength. I LOVE seeing them this happy and involved! 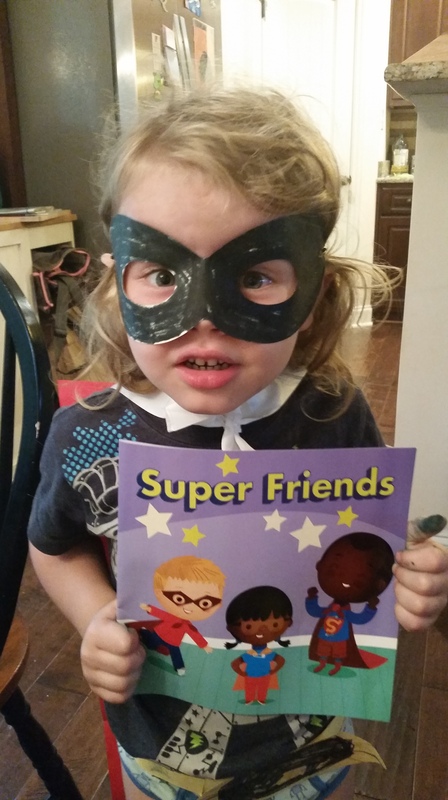 We also read an awesome comic-style book about being Super Friends and super helpers. 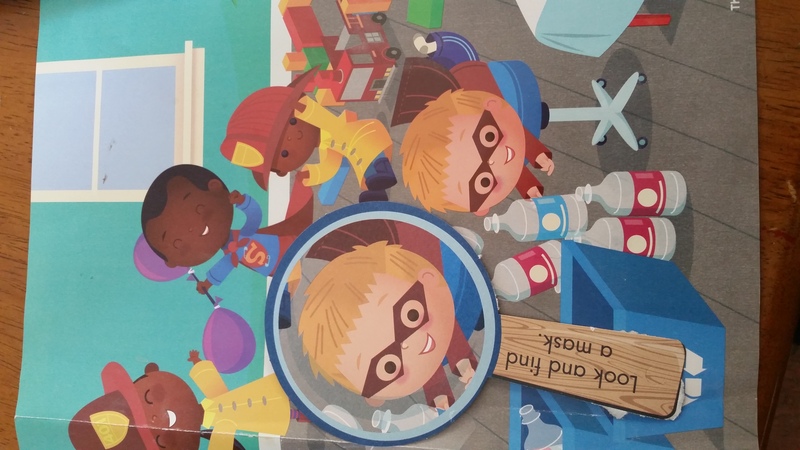 I love how MGT applied the admirable characteristics of super heroes to every day life for kiddos. Being responsible, helpful and caring are every day super powers! While this week HAS been all fun and games, there has also been some serious learning going on! Our Little Journal’s this month are all about numbers and counting; with a fun super hero twist of course! X has really taken to the journals these last few months. I love being able to see his progress all in one place. While number recognition is review for him right now, the journals give him the opportunity to practice writing skills and use his creativity while also learning math skills. My creative boy loves this Art Integrated Learning style! We also had a blast using the Look and Find spy glasses to focus on the details. Possibly my favorite part of this monthly activity is the fun extension activities that are printed on the backs of each spy glass. I love how gross motor, dramatic play and math are all integrated into this activity! With week one completed, we are so excited to see what SUPER fun is in store next week! !